The ABLE Fusion level gauge is the most advanced, accurate and reliable level measurement system combining the operation of a float operated magnetic level gauge with a guided wave radar to offer two independent proven level technologies in one system. The magnetic level indicator offers a clear visual level display whilst the guided wave radar provides a level measurement independent of the float operated level gauge. The Fusion gauge can be provided as a ‘dual chamber’ design, where the guided wave radar instrument is mounted in it’s own chamber connected adjacent to the level gauge body, or within a single chamber where the guided wave radar occupies the same body as the magnetic level indicator float, whilst operating independently of the float itself. Either arrangement requires a single set of process connections to the vessel making it ideal to replace existing sight glasses, reflex gauges or displacer instruments generally mounted in this way. 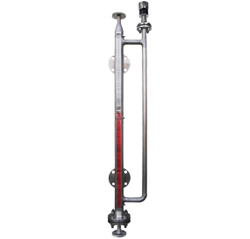 – Combined Magnetic Level Gauge and Guided Wave Radar Level Transmitter, in one instrument using one set of vessel connections. – Clear, reliable local visual indication of level (as detailed above). – High accuracy, independent continuous level measurement output using proven guided wave radar technology. – Separate, redundant technologies with no common mode failure between local indication and measurement output techniques. Whilst the visual indication is non-powered and relies on the position of the magnetic float to indicate level, the guided wave radar has no moving parts and measures level by use of microwave pulses that are reflected from the liquid surface with the elapsed transmit and return time measured to produce a very high accuracy level measurement. In the unlikely event of failure of one of the instruments, the other would remain in operation. Ultimately the magnetic level gauge portion of the instrument could also be fitted with a clamp on transmitter or switches providing redundant measurement outputs to that of the guided wave radar so that process control could continue under any situation. For more information regarding ABLE Fusion Level Gauges, please click here.